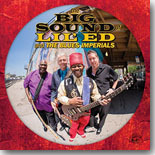 We go to Chicago for everyone's favorite party band --- Lil' Ed and the Blues Imperials --- for this month's Pick Hit. Austrian keyboardist Raphael Wressnig is a new name for many of us, making his new CD, The Soul Connection, and easy pick as our Surprise CD of the month. Our Flashback feature looks back at a re-issue of some recordings by Landon Spradlin, entitled No More Blue Mondays. Our What's New section features new CDs from William Bell, Vanessa Collier, Deb Ryder, Popa Chubby, John Weeks Band, Peter Karp, Mike Zito, Sharon Lewis, Jeff Chaz, Rory Block, Wille and the Bandits, Erja Lyytinen, and many, many more.